Hudson Ortyn, fascinated by JR’s use of large-scale images to make personal statements, shared the video with juniors Kovi Konowiecki and Sean Wilkinson, friends she knew would appreciate its underlying message. 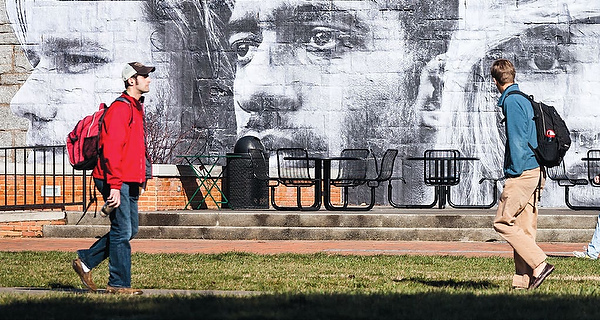 Over the next two months, the three created “Inside Out: Wake,” their own interpretation of JR’s vision resulting in an over 11-foot-high and 63-foot-wide portrait of five upperclassmen chosen to represent different parts of the Wake community. For Konowiecki and Wilkinson, this concept was nothing new. The two had already started a blog titled “Forest Folk” that celebrated students’ unique styles and backgrounds. Despite a loyal fan base, they were looking for a way to reach the Wake community as a whole. “We had an idea, but it wasn’t fully developed,” said Wilkinson. “We really just wanted to get a snapshot of the Wake campus at its most diverse level.” With their passion and vision intact, the three friends approached Matt Williams (’09), assistant director in the Office of Diversity and Inclusion, with their plans. With the administration’s support, Hudson Ortyn, Konowiecki and Wilkinson set up a website and Facebook page to share their inspiration for the project as well as to post photos and general information regarding its development. 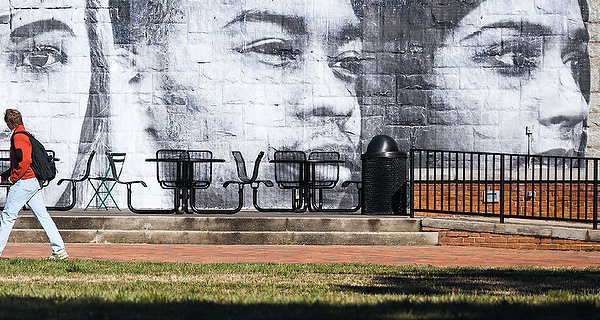 Despite a broken Kinkos printer in Winston-Salem that sent them on a nighttime trek to Raleigh to print the images, the project has presented more rewards than pitfalls. After a lengthy pasting process that took six-and-a-half hours, Konowiecki recalled putting the last strip of paper up on the wall. “We all stood there and looked at it, which was a really special moment for me having worked for seven hours and finally being able to see this finished product that we created,” he said. As for what’s next for the trio, a documentary is in the works that they hope will bring the project full circle. Hudson Ortyn, from Newton Square, Pa., sees the film as a way for the message of mutual respect and inclusion to continue beyond the confines of Wake Forest and inspire more students to bring such issues to the forefront.